To sum up the situation in Zimbabwe is a major undertaking and one which is too complicated to cover in brief, so the following can only highlight a few of the issues. There was a time when the country, which is rich in both agricultural and mineral resources, was completely self sufficient in food and exported to many neighbouring African countries. However, by the early 90's, things began to change radically, with a complete breakdown of agriculture in the country which resulted in near starvation for a large percentage of the population. Inflation became the highest the world had ever seen and that, together with the burgeoning spread of AIDS, spiralled the country into economic and social chaos. The abandonment of the Zimbabwen $ as the currency and its replacement by the US $ led to pensioners becoming paupers overnight and this was when Tom Benyon established ZANE, initially to support the elderly. At the same time, there was also a huge increase in the number of orphans in the country due to both the onset of AIDS and the deaths of parents in political disturbances. While Grandparents and other family members had taken on the parenting role, the change in their economic circumstances meant that often school fees could not be paid. 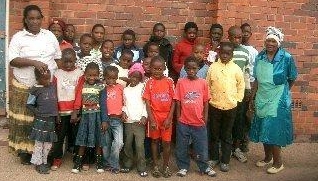 Although the orphans are fed through the ZANE feeding programme, they have no chance of raising themselves above the poverty line without education. The Pelandaba Orphan Fund was established to fill this gap.